“Transcribe the Bomb” has launched! 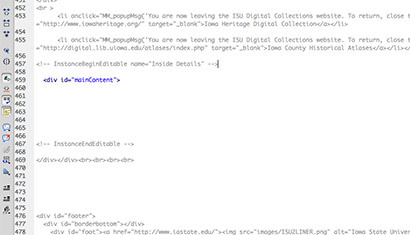 In 2016 the Iowa State University Library completed a six-year project to digitize an entire run of the campus yearbook, The Bomb. Comprised of nearly 45,000 pages, the digital versions are not easily searchable due to the wide variety of fonts and graphic elements used throughout the decades. Just look at the text from one page of the 1911 Bomb. The font and layout are unique, making the automated transcription process nearly impossible. A year of the “Bomb” will appear, after clicking “contribute now” and you will be able to begin the transcription process!!! Do not transcribe text found on clothing, pennants, sings, or other sources within the image. 8.Repeat the steps to transcribe more ISU moments! 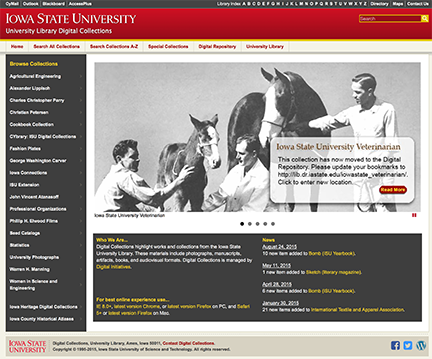 If you need more help you can find an interactive tutorial, examples and printable instructions on the ISU Library Guide Page: http://instr.iastate.libguides.com/transcribe or feel free to contact us at any time at: digital@iastate.edu. Good luck and happy transcribing!! 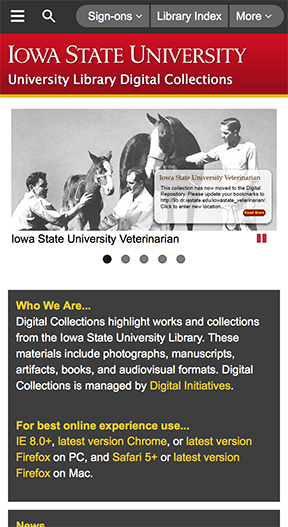 Two months ago, I posted in this space about moving the Digital Collection pages over to Drupal. 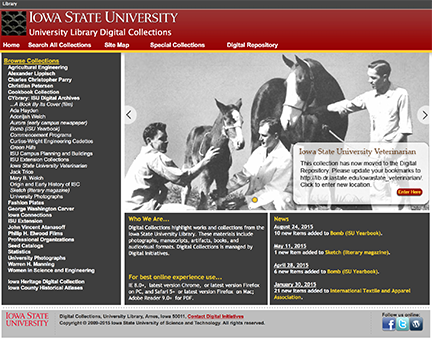 The pages have all been moved over now, and they are live (http://digitalcollections.lib.iastate.edu/.) In this post, I’m going to dive deeper into Drupal and explain one of the things I really like about using Drupal: the Page Tree. When you use the Page Tree, page names become very easily identifiable. No more: .html pages. Now pages simply end with: [page name here]. The page tree method allows logical, and easy to understand organization. There are a few items to keep in mind, and I’ll explain those as we proceed. Notice on the page tree page, there is a list underneath the Tree icon (Home,) and then each little white triangle turns black when you open it, and shows the pages associated with it below. icons (looks like a folder,) represent actual pages, where the icon (looks like a piece of chain,) represents a link. When the selected page is highlighted (here in blue,) the Page Properties are indicated for that page. Notice that the page tree pages/links are in red. Not all page trees have links this color. After the styles were added, these link turned from default black to red. I’ll have to see what happens with the links on the Special Collection as I start to style them. I really like the Page Properties; it gives a lot of good, self-explanatory information. Right from this window, you can Change Settings; Make a New page/link (which will become associated with this page;) Edit the page/link; Change Permissions (I strongly recommend NOT doing anything with this, unless directed by the IT department;) View the page/link; Trash the page/link. Let’s click on the Change button. The link is grey, and italicized, to indicate invisibility. OK, let’s click Cancel on the Page Properties page to back up. There is one more feature I will share today in Drupal that is handy in a pinch. (And goodness knows, I’ve been in a pinch once or twice…or, well, never mind.) When logged in to make changes on the Drupal pages, there are few tabs across the top of each page. View, Edit, Revisions, Permissions, Drafts. Let’s look quickly at Revisions. What a wonderful feature. A real lifesaver, believe you, me! If you goof-up on a page you can easily go back in time and select the revision you need, whether a minute ago, or last week. This is a nice way to work, and fairly worry free. That makes working with Drupal pretty fool-proof. Which is why so many people are able to use Drupal without much training at all. 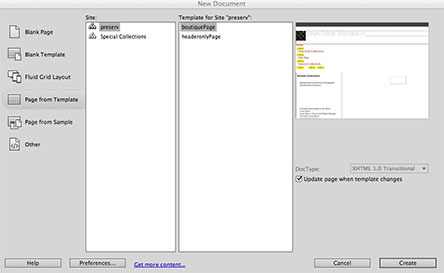 So, remember back to May 19 of this year when I began talking about creating templates in Dreamweaver, and again on July 21, when I blogged part two of that series? And also remember how I drone on about technology always changing? Well…. 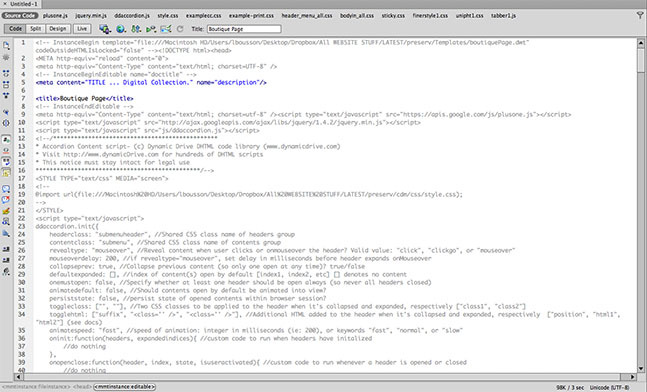 Throw those two blogs out the window and digest this: I am no longer using Dreamweaver to make our webpages. 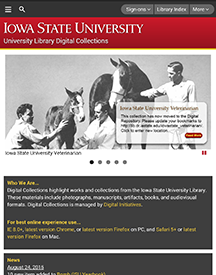 Our library has moved to Drupal for content-based webpages. And in doing so, I needed to learn it quick. Now, granted, I was given a great deal of leeway as to when to implement this for our pages. I could wait a year. But I had my own agenda. Not only did I need to move Digital Collection pages over, but also Special Collection pages. And I set my timeline to be the end of 2015. Well…why not? Let me take this blog space to begin talking about Drupal, and my first impressions. But back to self-authoring. This is a good thing for a large portion of library departments. Allowing each department to design and implement their pages grants those departments to update their information on the fly and this pretty awesome too. Plus, to have “templates” in place helps to maintain the overall layout theme of the university. In having a consistent design, every page of the university appears more uniform. Then there is the concept of responsive design. I myself have had issues with this very thing in the past. This is where Drupal comes in and does the heavy lifting. Once you’ve created a page, it automatically makes it responsive. In other words, whether displayed on desktop or mobile device, or tablet, the page will be displayed in the best possible manner. The image(s) will shrink down to the appropriate size and what is called a hamburger will appear (typically in the upper left or right hand corner of the page,) for the drop-down menu. So, what does that mean for designing pages going forward then? Well, a lot of things. First of all, because our library has a great library-external, but on-campus, support from the ITUIS department, I don’t have to worry about consistency across web browsers as I had to in the past. The ITUIS department has worked those issues out with Drupal already. We don’t have to re-invent the wheel here; they follow ISU template guidelines and work from there. 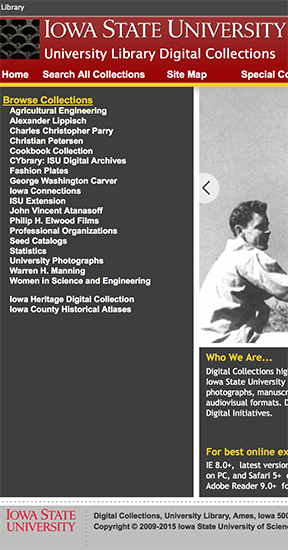 Thankfully, because Digital Collections and Special Collections are on a separate server, this allows us to maintain our sites separately, which in turn gives us even greater control over the design and layout of our pages. But what does that really mean? There are differences; let’s take a look. BUT, take a look at the portrait view layout on a tablet. (A lot better separation here, plus no cut-off of images. The point is Drupal makes designing responsive pages pretty easy. 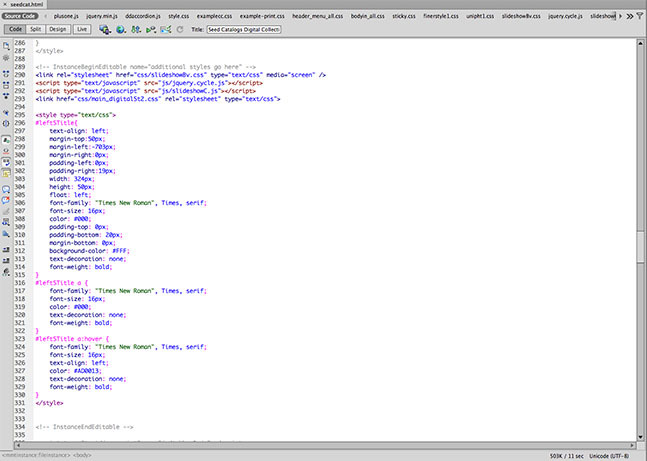 The most intensive part was copy and pasting the pages over from Dreamweaver, and constantly contacting the ITUIS department to get the styles displaying correctly. I’m glad I started with the smaller Digital Collection site however, because when we attempted to make the new pages go live, everything was defaulting to a wrong URL link. First, we thought we were going to need to manually re-mapped all the pages to the new pages, so that old URLs would bounce to the new page URL. Now, ITUIS has stepped in and indicated they will be able to solve this issue using another tool. We will have to monitor this unfolding drama and we will have to think it through for the larger Special Collection pages. This post is a follow-up to Adventures in Making Templates: Part I. To create a page from a template: File—>New… —>Select Page From Template, then navigate to the template page you created. You will notice all your “locked in” code — code that will stay consistent on all pages — is grayed out. You will not be able to edit this area at all on this page. Go on. Try it. Select a section and try to delete it. Can’t. Be. Done. You can select it; but you can’t edit it in any way. However, the areas that are shown in blue or black text are editable areas. So, at the top, you see where I can change my meta content and name, plus page title. You also have to be aware that not all areas are obvious as being editable. This is where you need to be aware of your code. Further on down the page is the space for the inside content, followed by the non-editable footer. It’s pretty easy to go from there. Once you have the page created, save with the actual name you plan to use and you’re set! One of my main issues without using a template was the variety of space between the end of text and the footer. This was a browser issues: some browsers played nice, and others didn’t. Using a template took this issue away. Our pages are now consistent whatever browser one chooses. Having the template also made it easier for me to add elements that were lacking on every page, like the social media icons. Templates are great when you have several pages to maintain that all have the same basic layout. They are not for all sites/layouts, but work well for web masters who have many pages with certain elements that need regular updates. I’ve had templates on my radar since I first started working on my pages. I am glad I finally learned how to create them. You may find them useful too. Digital photographs were taken of entire scrapbooks that J.B. Davidson created from his trips to China and Europe. In addition to the many photographs included in the scrapbooks, we also scanned many photographs from the early days of agricultural engineering at Iowa State. 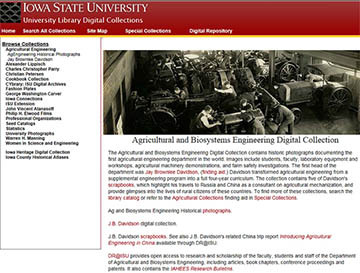 We also have a link to our Digital Repository which has J.B. Davidson’s “Introducing Agricultural Engineering in China” from 1949. 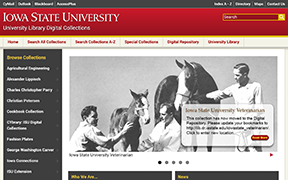 With the variety of materials included in our Digital Collections we’ve tried to give people a look at some of the more visually interesting items in our collections and the Digital Repository includes the more scholarly works. This start could lead a curious researcher to find much more by visiting our archives.